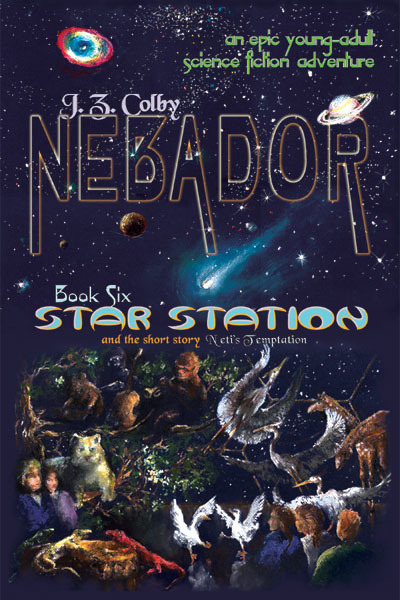 This is the sixth book in the Nebador series and as you can see, I'm a big fan. The series has had me hooked, since the day I read the first book. While this book may be for Young Adults, I enjoy learning from each book. The series begins (Book One) when Ilika the captain of the deep space response ship Manessa arrives in a medieval kingdom seeking a crew for his mysterious ship. Those who pass his initial test are a bunch of slaves and an inn keeper's daughter. The final few who qualify include: Rini, Mati, Kibi, Sata, and Boro. You can read about them here. The previous book (Book five) had them planet hopping but now they've flow on to the star zone, much beyond the reachable solar system and have their own lessons to learn on Star Station Satamia (where hopefully Mati's knee will be operated upon). Here, they learn that in order to be true citizens of Nebador they need to always keep learning and growing. Of course, on the backward planet where they were born, the kingdom had no larger purpose. People lived as best as they could, accomplished a few things in their lives or didn't accomplish anything at all. Life revolved around living for yet another day, and if being cruel (such as towards slaves or animals) meant you had a more 'luxurious' life, well that was just the way it was. Through their journey Ilika crew learnt this was not the ideal way to live. This message was reinforced on the star station. 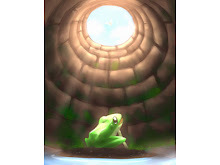 1)Complete awareness of everyone and complete attention to all my responsibilities: While Kibi goes through a rigorous formal psychic development program, others learn this message in different ways. Boro through his juggling classes and Sata through her dancing classes. Only when one is aware of the environment around them, can they see what others can't see. The next step then on becoming aware is to be responsible. For instance, when Kibi first started her training, she sensed 'fear' in the water in which she was diving, but she failed to notice a little lost creature whom she could have helped. Or when Boro tried to juggle and do his other activities at the same time, which included merely walking around, he did bump into things. This lesson may be difficult to master, but it is so crucial to be a good human being. 2) Do not judge others by their appearance alone: The 'big story' in this book is about Mati's surgery. She is so looking forward to standing on her own two feet again and discarding her crutch for ever. Unfortunately, the only surgeon who can successfully fulfill this dream of hers is a giant 'monster' - a 3 meter tall large green gangly insect with claw like mandibles. Howeveer, Mati manages to overcome her fear of her surgeon K'stimla and prepares for surgery. The surgery itself becomes complicated, inner fears lead to Mati slipping away, the purple spirit (many creatures of pure light also exist on Satamia)has to deepen the link between Rina and Mati, to enable Rina to penetrate deep into Mati's mind and conquer her past fears. Fear cripples in its own way. Now they will never be free of each other's thoughts and feelings. Rina readily agrees to take this step to save Mati. In fact, in this book, both of them share the joy of their 'marriage' with other star-ship residents. Of course, each crew member and not just Mati, has to learn to deal with creatures who look different. For instance, it took Boro some time to get used to a ursine docking controller but Glorm and he soon bonded over a fishing expedition. We often judge others at first glance, Ilika's crew learnt how wrong they could be and so did I. 3) Sometimes things are not what they seem: The star station is housing a group of reptiles, who were rescued when their planet became extinct. They are housed in a simulated desert environment, but something is wrong. The females refuse to mate and their numbers are dwindling, plus attempts to find another planet for them oontinue to fail. Mati makes the mistake of opening the door of this simulated environment with the help of Sata (She opens the door because she wants the creatures to experience freedom, just as she now experiences freedom without her crutches. Her intentions are good but the immediate consequences are not what she expected). The reptilian creatures venture out of this gap, but are dazed with what they see on the star ship, and accidentally a baby ursine is also killed in the bedlam.Of course Mati and Sata have to make amends. A huge step has to be taken by them, in other words, they have to be physically transformed into these reptiles, Rini guesses, the male reptiles would want to mate with them and ventures forth to protect Mati. Boro follows suit. Thus all four transformed reptiles find themselves in this simulated environment so that they can learn about them and help them find a new home. Sata's outburst that they are different and are from the star station results in a revolution of sorts and they finally learn that the original environment of these reptilian creatures was a wet, humid jungle and not a desert. The task to find them a new suitable home begins anew and there is a successful ending. Similarly, sometimes in life, one needs to stand back, probe, find out more, reach a suitable conclusion and then take proactive steps in the right direction. Jumping to conclusions based on assumptions or rudimentary information doesn't help. The author, J.Z. Colby in his chapter 'Afterthoughts' points out: ...I'm sure you know by now, this story isn't really science fiction..... 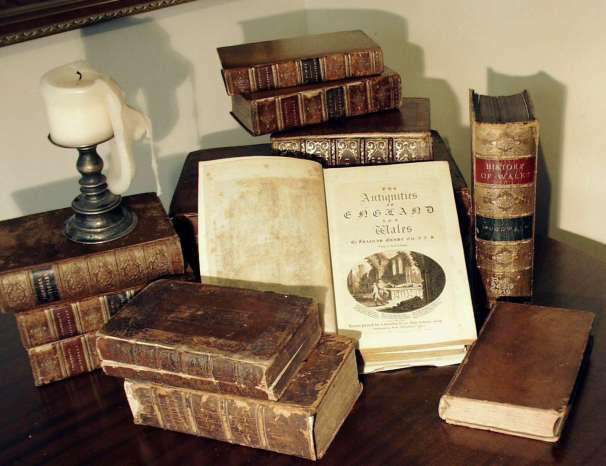 If the Nebador stories have anything to leave to the world, it is a glimpse of the difference between reality and the many layers of assumptions and myths that most people live by. 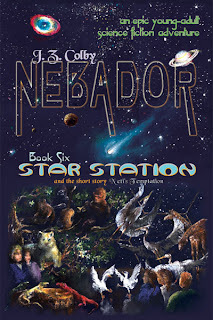 If while reading these stories, you have experienced even a tiny peek beyond normal 'monkey-mammal' (Ilika's crew is referred to as monkey-mammals by other residents of the star station) thinking, then you have set your feet on the path to Nebador (by whatever name)! Nebador is a great series and this particular book is one of my favourites in that series. Each page is a gem. Born in the Mojave Desert, J. Z. Colby now lives and writes deep in a forest of the Pacific Northwest. He has studied many subjects, formally and informally, including psychology, philosophy, education, and performing arts, but remains a generalist. His primary profession as a mental health counselor, specializing with families and young adults, gives him many stories of personal growth, and the motivation to develop his team of young critiquers and readers. All his life, he has been drawn toward a broad understanding of human nature, especially those physical, emotional, mental, and spiritual situations in which our capacity to function seems to reach its limits. He finds fascinating those few individuals who can transcend the limits of our common human nature and the dictates of our cultures. In his spare time, he flies helicopters and airplanes. Good to see a star-*** book not being about science fiction or fantasy. So, we need to go to distant planets and galaxies to realize what mistakes we are doing here... Or at least we need to take a virtual tour through a book! State of humanity! Wow Lubna another brilliant selection and review. This book communicates some important values couched in an interesting story. Used to love that kind of books when I was a teenager. Would definitely have read it then. I think my nephew might enjoy this series, so thanks for another great review. This sounds like a great series! I for one love books that are intended for teens. There is something to be learned from them, or at least reminded of. I had not heard of this before reading your blog. Thanks for reviewing these. Great new series to start reading! You do make the series sound like a whole lot more fun than 'just' a YA book. And I thought it was great the way you summarized the lessons to be learned. @AK: Thanks for your kind words. Your book sounds interesting. I love the two characters you posted about on your blog. I'm always thrilled to see books for kids (of any age) that have teaching points. Thanks for pointing those out in your book review. I really like the way you wrote this and provided the things you've learned. Anyone can post their reviews on Lubna's blog, on GoodReads.com, on LibraryThing.com, on Facebook, or anywhere else you'd like. Google Alerts will usually tell me about them, and I'll copy them to my web site. If nothing else is comfortable, you could just email them to me. My email address is all over my web site, www.nebador.com. Be well, and happy reading! Thank you, JZ Colby, nice to see you drop by. I am sure many will be delighted to download book 1 and I am sure they will post/send their comments. Wow! It still amazes me how much real-life lessons we can learn from fiction books. Best part for me was what you said about not judging others by their appearance alone. I'd like to add is not to judge others by what you hear as well. Often, we have developed this stereotype image of a person. Whether we realize it or not, this stereotype image has already caused us to judge the other person and that prevents us from learning more about them and from them.